In Japan, Kabuki is a traditional form of theater art. Kabuki is a Japanese word that means bizarre theater. Young people that used to dress in a strange manner and were rebellious were known as kabukimono. 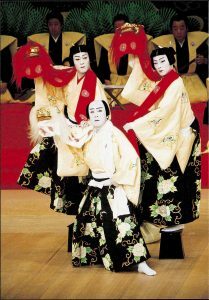 Because the characters performing the kanji dance and sing, kabuki came to mean the art of dancing and singing as well. Over time, the art of kabuki has changed. The kabuki that you can see nowadays is not the same as it was originally. Kabuki was originally performed by only women. They played all of the roles, including those of men. The stories performed were based upon the common people of the area and included a twist of comedy. Not too long after the art was created, the women that performed kabuki mostly became prostitutes, so they were no longer able to perform in the theaters and, shortly after, men took on the roles. The focus of kabuki changed from a dance to a performance under the men. Not long after the men took over, they began working in the prostitution ring as well for both women and men customers. Many times, this would cause fights to break out during the performance over handsome, young actors. Because of this, young males were banned from performing. After this, kabuki was performed by older men. They worked hard to bring back the good reputation of kabuki. Men who played the role of women were called Onnagata or Oyama. At that time, there were two roles in kabuki, rough style (Aragoto) and Wagoto (Sakata tojuro). The men’s kabuki, also known as Yaro kabuki, was very influential and popular in its time. Very detailed makeup was worn by the kabuki artists. The reckless warrior, or Aragoto character, wore loud makup and bright clothing. This character was very exaggerated and had a lot of actions to perform. The Wagoto, on the other hand, was a role that was more cultural and performed more realistic dialogue and gestures. At the outbreak of World War II, a lot of the local theaters were destroyed in the bombings. Because of this, there was a ban placed on kabuki. In 1947, the ban was lifted and the kabuki performances were again started. They began to flourish again all over the country of Japan, and still do today.